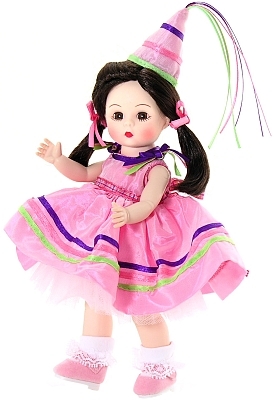 8" Birthday Wishes Wendy is ready to party in her bright pink taffeta dress accented with purple, green, and pink ribbon trim. A pink plaid ribbon ties in a bow at her waist. Her pink party hat is topped with purple, green, and pink ribbon streamers. She has dark brown pigtails and brown eyes.